Discussion in 'Z4 Roadster & Coupé' started by Zorg, Apr 20, 2013. The interplay of classical proportions and state-of-the-art technology defines the unmistakable character of the BMW Z4 – and now an updated version of the Roadster is ready for action, armed with a raft of additional powertrain and equipment innovations. The new BMW Z4 represents a time-honoured and yet alluringly contemporary interpretation of the traditional roadster concept. New exterior features, detailed interior refinements, the new Design Pure Traction equipment package, the new entry-level sDrive18i model and the latest additions to the range of BMW ConnectedDrive features all provide fresh impetus and lend the BMW Roadster even greater appeal and individuality. The new BMW Z4 takes to the stage 25 years after the legendary BMW Z1. That Roadster turned heads when it was unveiled at the 1987 International Motor Show (IAA) in Frankfurt – not only on account of its revolutionary door concept, but also thanks to its agile and precisely controllable handling. With the BMW Z1 began the latest chapter in the history of BMW Roadsters – a tradition which stretches back to the 1930s and reached the first of many high points with the BMW 328 (winner of the 1940 Mille Miglia) and BMW 507 from 1955. The BMW Z3 and BMW Z8 triggered a fresh wave of excitement for the classical open-top two-seater concept in the 1990s. And they also paved the way for the first-generation BMW Z4 and its successor, the brand’s first Roadster fitted with a retractable hardtop roof. Design: classical proportions infused with modern character.The success of modern-day BMW Roadsters is rooted in the rigorous execution of a concept, a process which has left its mark on both the design and the driving properties of each car and is clearly recognisable in the new BMW Z4. The sweeping bonnet, long wheelbase, low beltline and low-slung rear end play a more vivid and uncompromising part in shaping its appearance than is evident with any of its segment rivals. The low seating position just ahead of the rear axle gives the driver and passenger a particularly intense experience of the longitudinal and lateral forces working on the rear wheels. This sense of being “part of the car” also allows the driver to grade the amount of power he’s feeding through the rear axle with sensitivity and precision. That’s the recipe for roadster feeling, BMW-style. The hardtop roof also blends seamlessly into the car’s form. As it closes, it seals a smoothly flowing roofline, while large window surfaces optimise all-round visibility and the feeling of space inside the car. Once opened, the two roof elements are accommodated, one on top of the other, in a compact package inside the Roadster’s road-hugging rear. The A-pillars – painted an understated black – also underline the low-slung silhouette of the new BMW Z4, especially when the roof is open. The optional BMW Individual hardtop – available in the two contrast colours Black non-metallic and Glacier Silver metallic – provides a feast for the eyes when the roof is closed. The hardtop can be opened at the touch of a button while the car is moving at up to 40 km/h (25 mph) in an automated process lasting 19 seconds. The distinctive twin circular headlights team up with the broad BMW kidney grille to form a roadster-specific interpretation of the brand’s signature front-end look. The standard bi-xenon headlights of the new BMW Z4 have an extremely slim design and extend well into the front wheel arches. They feature LED light rings which emit daytime driving light in the brand’s hallmark style. Added to which, the light sources now have a strikingly three-dimensional design which accentuates the intricate technology of the headlights. Cutting across the tops of the headlights are LED accent lights, whose metal insert bears BMW lettering. The integrated turn signal indicators have chrome-coloured surrounds, which lend further emphasis to the sophisticated character of the light units. Plus, a newly designed, tapered surround for the side indicators adds a dynamic sweep to the gills on the front side sections of the car. Striking touches: new paint finishes, Design Pure Traction equipment package, additional light-alloy wheels and the M Sport package.A total of 11 external paint finishes are available for the new BMW Z4, including the new Mineral Grey metallic, Glacier Silver metallic and Valencia Orange metallic, which can only be ordered together with the Design Pure Traction option. This new equipment package lends the Roadster an extremely lively aura; the interior, for example, boasts an energy-charged contrast of black and orange. The bespoke Alcantara door panel trim, like the lower section of the instrument panel, comes in orange. The black leather seats have contrast stitching in Valencia Orange and an accent stripe running down the central section of the backrests and seat cushions. This stripe is likewise orange and is flanked by two thin white lines. The door panel trim and lower section of the instrument panel can also be specified in black as an option. Another exclusive element of the Design Pure Traction package is the metal weave trim strip, which can be combined with further decorative elements in high-gloss black for the door openers and the gearshift or selector lever. This new equipment package replaces the previously available Design Pure Impulse and is also available in combination with other exterior paint colours as an option. New interior additions to standard specification include high-gloss black surrounds for the central air vents and the iDrive control system’s folding Control Display, which comes as part of the optional Professional navigation system. Elsewhere, exquisite Fineline Anthracite wood has been added to the selection of interior trim strips available as an option for the new BMW Z4. The BMW Z4 sDrive28i, BMW Z4 sDrive35i and BMW Z4 sDrive35is are offered with Kansas leather trim, which is available as an option for the two other models. New variants have been added to the range of optional light-alloy wheels as well, including newly designed 17-inch and 18-inch wheels in V-spoke design, both of which will be combined with mixed tyres. The engaging character of the Roadster as a driver’s tool is given particular emphasis by the likewise optional M Sport package, which contributes M Sport suspension, 18-inch M light-alloy wheels and an M aerodynamics package with large air intakes in the front wing and a rear bumper inlay painted Anthracite metallic. Bringing an extra dose of sporting flair into the interior, meanwhile, are features such as sports seats, an M leather steering wheel, M driver’s footrest, M door sill finishers and an anthracite-coloured roof liner. The Aluminium Carbon trim strip, leather M gear lever knob and grey dials for the instrument cluster lend the finishing touches to the interior ambience. 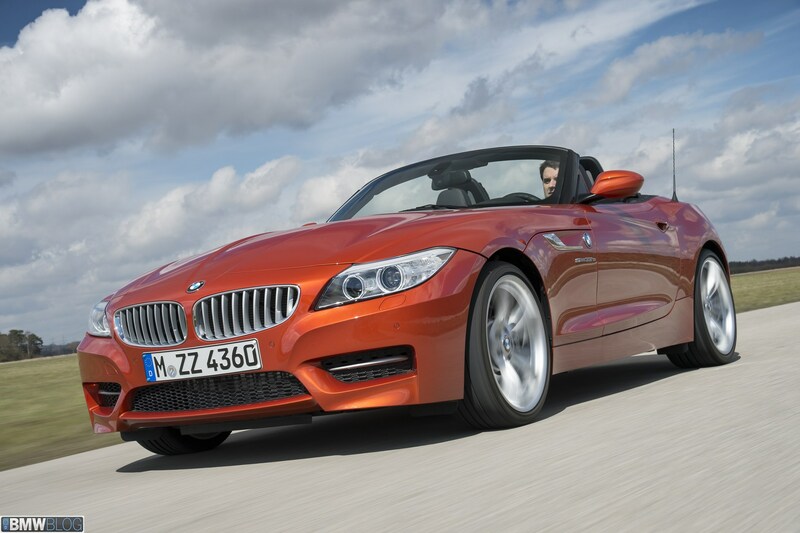 The new BMW Z4 sDrive35is comes as standard with a model-specific version of the M Sport package. Engines: BMW TwinPower Turbo technology at five output levels.The BMW Z4 will be available with a larger, five-strong line-up of petrol engines from launch, and customers will be able to choose from three four-cylinder and two six-cylinder powerplants. Their most significant shared feature is BMW TwinPower Turbo technology, which ensures an exceptionally effective balance between driving pleasure and fuel consumption throughout the output range. 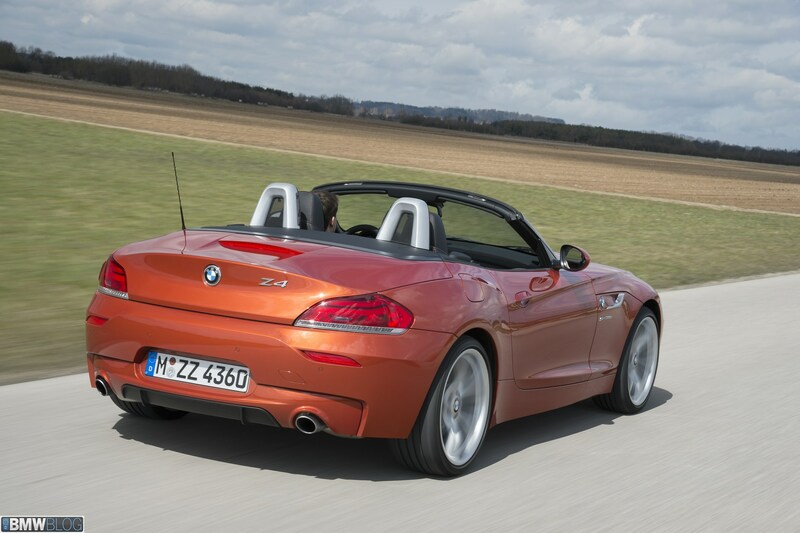 In addition, all four-cylinder variants of the new BMW Z4 already meet – as standard – the stipulations of the EU6 exhaust emissions standard due to come into force in 2014. 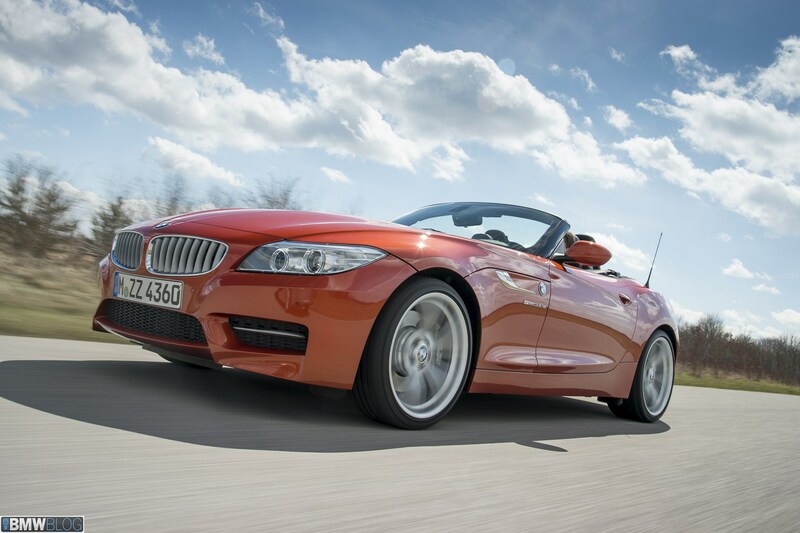 The BMW Z4 sDrive18i takes to the stage as the new entry-level model. It is powered by a 2.0-litre engine with BMW TwinPower Turbo technology which develops maximum output of 115 kW/156 hp at 5,000 rpm. The new variant of the four-cylinder unit delivers peak torque of 240 Newton metres (177 lb-ft) between 1,250 and 4,400 rpm. The BMW Z4 sDrive18i is fitted as standard with a six-speed manual gearbox, but an eight-speed sports automatic can also be ordered as an option. The new model accelerates from 0 to 100 km/h (62 mph) in 7.9 seconds (automatic: 8.1 seconds) and hits a top speed of 221 km/h / 137 mph (220 km/h / 136.5 mph). Average fuel consumption for the BMW Z4 sDrive18i in the EU test cycle is 6.8 litres per 100 kilometres (41.5 mpg imp) with both the manual and automatic gearbox. CO2 emissions stand at 159 grams per kilometre. The BMW TwinPower Turbo technology package for the new BMW Z4 sDrive18i includes twin-scroll turbocharging, High Precision Direct Petrol Injection, VALVETRONIC fully variable valve control and Double-Vanos continuously variable camshaft control. An identical version of this technology package is also used in the engines – likewise 2.0-litre units – under the bonnet of the BMW Z4 sDrive20i and BMW Z4 sDrive28i. These engines can also be ordered with an eight-speed sports automatic gearbox with shift paddles on the steering wheel as an alternative to the standard-fitted six-speed manual. The automatic has been optimised to deliver even better acceleration from 0 to 100 km/h (62 mph). The existing engine variants – the sDrive20i, sDrive28i, sDrive35i and sDrive35is – retain their places in the range. Extensive comfort-enhancing equipment.The new BMW Z4 delivers the driving pleasure customers have come to expect from the brand, fulfilling the desire for both sporting ability and comfort. Drivers can use the standard-fitted Driving Experience Control switch to select a configuration to suit the situation at hand and satisfy personal preferences. COMFORT, SPORT and SPORT+ modes can all be called up using the rocker switch on the centre console. As well as adjusting the responses of the engine and DSC stability system, the different modes also alter the shift characteristics of the automatic gearbox, the responses of the Servotronic function and the mapping of the electronically controlled dampers, if these items are specified. These modes allow the driver to choose from a selection of distinctive and clearly differentiated set-ups for the car. Other items of equipment fitted as standard are xenon headlights, air conditioning, a heated glass rear window, the Soft Close Automatic function for the boot lid and runflat tyres with a run-flat indicator. The BMW Business radio – including CD player, AUX-IN socket and six loudspeakers – is a standard feature in all the variants of the Roadster, while customers can also choose from options including the BMW Professional radio and the Professional hi-fi-system with 14 loudspeakers. The similarly optional Professional navigation system enables high-resolution map graphics – complete with 3D view – on the 8.8-inch iDrive monitor. The navigation data for the system is stored on an in-car hard disk, which also provides 12 GB of capacity for personal music collections. 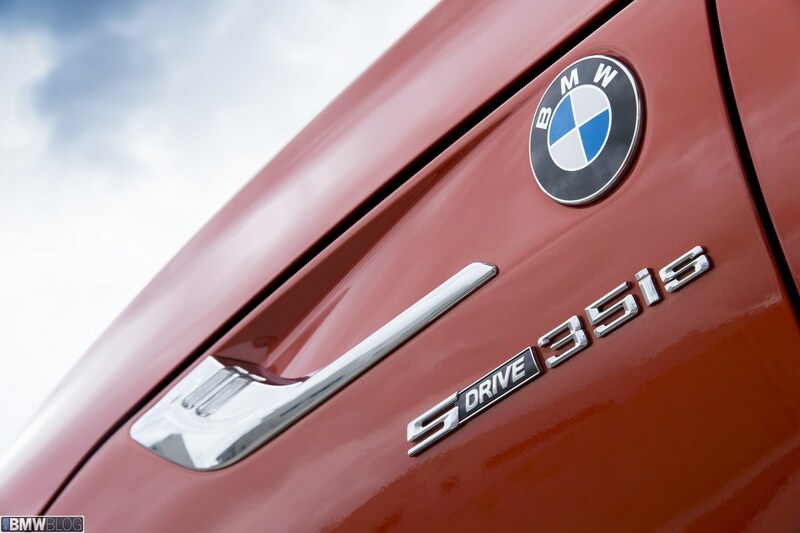 The range of driver assistance systems and mobility services from BMW ConnectedDrive has also expanded once again. The new BMW Z4 can be equipped with features such as a rain sensor, Adaptive Headlights and High Beam Assistant. Cruise control with braking function and Park Distance Control with sensors at the front and rear of the car are also available. If the Professional navigation system is specified, the ConnectedDrive Services option allows use of internet-based information and entertainment services inside the car. This system must be fitted to enable access to the BMW Online portal and apps using the Control Display and iDrive Controller. The Real Time Traffic Information function is also on hand, supplying the driver with congestion warnings and diversion recommendations in real time. Apple iPhone owners can use BMW apps, for example, to receive web radio stations, display Facebook and Twitter posts on the monitor and ask for them to be read out. The range of BMW ConnectedDrive features available for the new BMW Z4 also includes BMW TeleServices, BMW Remote Services, Concierge Services and Intelligent Emergency Call with automatic vehicle location and accident severity detection. Just another modern soulless bmw. Can't beat the z3 and the great z3m! Try driving one Mark, you might change your mind. Not into the modern bmw cars. No it's not a coupe, it's a Roadster, unless you are now Marketing Director of BMW ..........and i agree another coupe version would be nice as it was the best looking version of the Z4 to date. Never had the chance to drive one! You should borrow the 35is from the dealer for a weekend, I did and it is a nice animal, admittedly supported by electronics, but still nice, you would be disappointed with the bottom of the range though, like owning an 8v 1.8 z3 lifeless and no soul, so really no point, might as well get a mx5 and save the money. But the 35is different proposition, it will be my next car, not as raw as an //M Z3 but close. I agree with Tim, its a "convertable coupe"
It's a roadster with a hardtop not a coupe. A coupe has a fixed roof no folding! DOH!! it was a joke Mark !!!! !